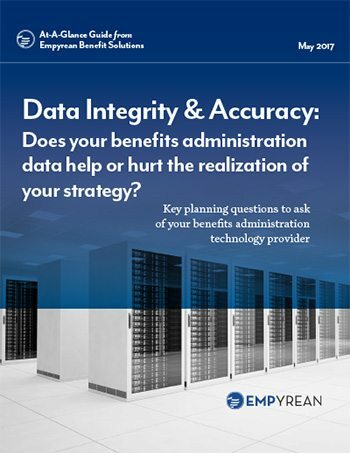 Read this free At-A-Glance Guide to see how data integrity and accuracy can impact your benefits strategy. How does your benefits administration technology affect your operations? Is it geared to handle complexity and agile enough to accommodate change? Does your benefits admin technology give you the flexibility to make your job easier? Does it simplify your data and report accurately? How does your benefits administration system find errors or missing information (costs, demographics, Social Security number checks, etc.)? How does your benefits administration system handle, alert, and resolve data errors? How do data integrity and accuracy issues affect your department’s – and your company’s – bottom line? How do you measure that, and how could improving your data integrity help reduce costs and improve services to your employees?